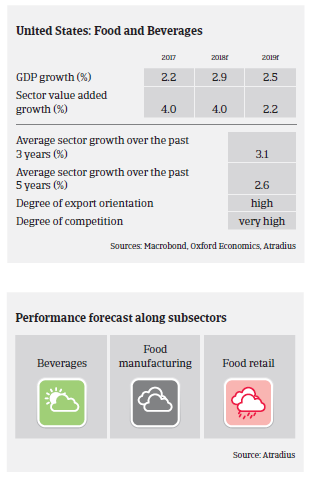 After shrinking in 2018 US food businesses´ profit margins are expected to decrease further in 2019, as fuel prices and other input costs are increasing. Food and beverage processing and manufacturing is one of the largest US industries in terms of employment, providing jobs for about 1.5 million workers annually. The sector consists of approximately 21,000 companies, and value added is forecast to grow 4% in 2018 and 2.2% in 2019. Competition is fierce in all main segments along the value chain (manufacturers, retailers, distributors), which has an adverse effect on businesses profit margins. After shrinking in 2018 profit margins are expected to decrease further in 2019, as fuel prices and other input costs are increasing. There have been many mergers and acquisitions (M&A) over the last couple of years, signaling a trend towards greater consolidation among large and legacy food brands. M&A activity will remain high as companies continue to look for sales growth and margin improvement. Success will depend on the ability of businesses to optimise synergies and to integrate smoothly. Organic food sales in the US still amount to just 5% of overall food sales, but have increased in recent years and are expected to grow further above the average market growth rate. Food preferences of consumers continue to benefit grocery stores where packaged food manufacturers have less of a presence. Natural, organic and gluten-free foods are strategic areas for companies aiming to increase sales growth. At the same time, new regulatory standards will play a significant part in determining food demand. The average payment duration in the US food industry is 30 days. Non-payment notifications remained stable in 2018, and we expect no increase in 2019. Additionally, no insolvency increase is expected next year. Access to external financing is not an issue, but many food businesses are private equity-owned and therefore highly leveraged. Our underwriting stance is generally open for the beverage segment and neutral for food manufacturing. However, we are more restrictive with food retail, due to throat-cutting competition, slow growth of legacy retailers and extremely tight margins in this subsector. As food safety and sustainability are becoming increasingly important, business success depends on the strength and transparency of the supply chain. Foodborne illnesses, contamination and fraud remain risks for food manufacturers - with a potentially major negative effect on profitability.